Many people suffer with food intolerances that can seriously effect their everyday lives - from their health and well being to their ability to eat out socially. These intolerances can sometimes be down to a lack of enzymes naturally occurring in the body. In these cases digestive enzyme supplements may be able to help. One common food intolerance is gluten intolerance. Gluten is a protein found in grains like wheat, and those with gluten sensitivity suffer with digestive discomfort and other unwanted side effects when consuming foods such as breads and pastas. Many people with gluten allergies tend to completely eradicate gluten containing foods from their diet, but an alternative can be taking an enzyme blend such as Enzymedica Glutenease that more effectively deals with the gluten proteins and reduces or eliminates the negative effects. As well as products for gluten intolerance, we also sell supplements that deal with dairy allergies, lactose intolerance, carbohydrate sensitivity and more. Enzymedica BeanAssist contains the enzyme Alpha Galactosidase, which breaks down complex carbohydrat..
Enzymedica DairyAssist is a dual-action formula that combines lactase to aid in the digestion of lac..
Enzymedica Digest + Probiotics is an enhanced formula that breaks down carbohydrates, fats, fiber an..
Enzymedica Digest is an enhanced formula that breaks down carbohydrates, fats, fiber and protein. 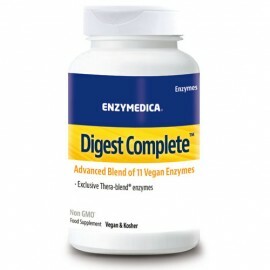 Th..
Enzymedica Digest Basic + Probiotics contains a gentle enzyme formula that breaks down carbohydrates..